With an eye on the upcoming general elections – scheduled to be held in 2018 – the Pakistan Muslim League-N on Friday unveiled 43-member federal cabinet with three nominees failing to make to the oath-taking ceremony due to reasons best known to them. With three advisers likely to take oath along with the three remaining ministers, it would be the biggest cabinet since the 18th constitutional amendment which has put limits on the size of the cabinet. 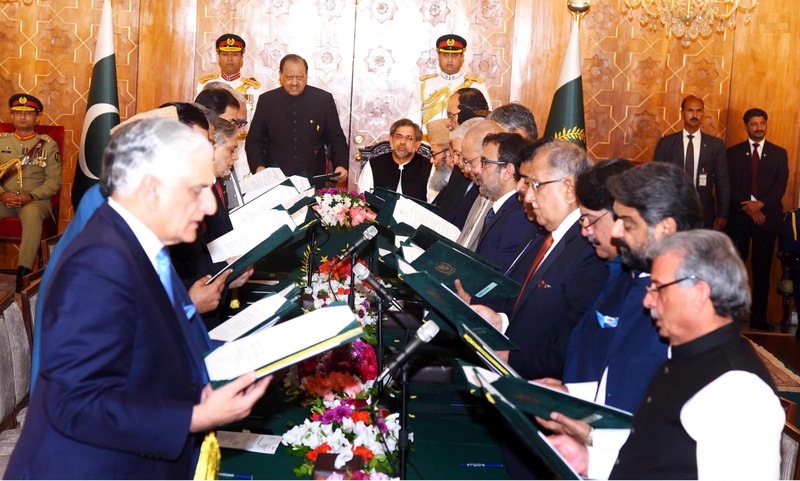 Those sworn in as federal ministers included Senator Mohammad Ishaq Dar, Senator Mushahidullah Khan, Senator Kamran Michael, Khawaja Muhammad Asif, Khurram Dastgir, Ahsan Iqbal, Khwaja Saad Rafique, Hasil Khan Bizenjo, Abdul Qadir Baloch, Salahuddin Tirmizi, Riaz Hussain Pirzada, Awais Leghari, Akram Durrani, Ghulam Murtaza Jatoi, Rana Tanveer Hussain, Pervaiz Malik, Hafiz Abdul Kareem, Syed Javed Ali Shah, Barjees Tahir, Zahid Hamid, Sadaruddin Rashidi, Sardar Muhammad Yousaf, Saira Afzal Tarar, Sikandar Hayat Khan Bosan, Sheikh Aftab Ahmed, Balighur Rehman and Ameer Zaman. Dr Tariq Fazal Chaudhary, Haji Muhammad Akram Ansari, Junaid Anwaar Chaudhry, Abid Sher Ali, Jam Kamal Khan, Marriyum Aurangzeb, Anusha Rahman, Dr Darshan Lal, Muhammad Talal Chaudhry, Barrister Mohsin Shahnawaz Ranjha, Barrister Usman Ibrahim, Abdul Rehman Khan Kanju, Jaffar Iqbal, Sardar Arshad Laghari, Pir Muhammad Aminul Hasnat Shah and Ghalib Khan took oath as the state minsters. The arrangement reflects that the heavy cabinet would continue till the next elections; implying that Shehbaz Sharif would not be elevated as the prime minister and rather Prime Minister Khaqan would continue beyond 45 days. Most of the cabinet members are old guards of the PML-N with changed portfolios. Some new faces, mostly from South Punjab, have been successful in making their way to the cabinet. According to ruling party members, South Punjab has been focused to get maximum seats during the elections from the area. “We have also taken new ministers from Sindh, Balochistan, Khyber Pakhtunkhwa and FATA,” they said, adding that the PML-N has proved to be the only national party in the country. Khawaja Asif, previously served as minister for defence and water & power, has sworn in as the foreign minister. Ahsan Iqbal, who worked as the minister for planning and development, has been entrusted with responsibility to run the affairs of the interior ministry as Chaudhry Nisar Ali Khan refused to serve more. Senator Ishaq Dar continues as the finance minister; while Khurram Dastgir, who was minister for commerce earlier, will now serve as the minister for defence. Furthermore, Mushahidullah Khan is back in the cabinet as the federal minister for climate change and Marriyum Aurangzeb has retained the portfolio of the state minister for information and broadcasting. Danial Aziz boycotted the swearing in ceremony for ‘not being taken as the federal minister’. Being a seasoned campaigner, he felt it below his dignity to join his junior peers as the state minister. Dosteen Domki and Mumtaz Tarar failed to make to the oath-taking for being out of the city. Since the number of the ministers and the state ministers was quite high, Prime Minister Khaqan had to constitute four new ministries and their constituent divisions under the provisions of Rule 3 of the Rules of Business 1973. Power and Petroleum divisions have been merged to create Ministry of Energy – a longtime demand which had been promised twice but never implemented. The business of the existing Division of Water & Power and Petroleum & Natural Resources shall be distributed between the two new divisions accordingly. Since Power Division has been merged with the Ministry of Energy, Ministry of Water Resources has been created with one constituent division, namely: Water Resources Division. 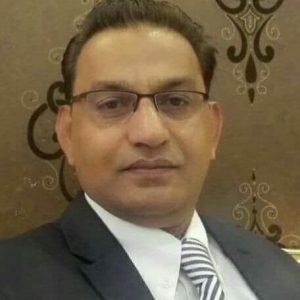 Syed Javed Ali Shah has been given charge of this ministry. Ministry of Postal Services has also been renewed, with only one constituent division, namely Postal Services Division. The business of the existing Communications Division to the extent of postal services shall be transferred to the new division while residual business shall remain with the existing Communications Division. The ministry is yet to be handed over to any minister. Moreover, Ministry of Commerce & Textiles has been created with two constituent divisions including Commerce Division; and Textile Division. The current business of the two existing divisions of commerce and textile industry shall be placed under the new ministry accordingly. Ministry of Statistics, with one constituent division, namely: Statistics Division; ii. Ministry of Privatisation, with one constituent division, namely: Privatisation Division; iii. Ministry of Narcotics Control, with one constituent division, namely: Narcotics Control Division. Accordingly, the residual ministries shall be named as: Ministry of Finance, Revenue and Economic Affairs, comprising three divisions, i.e. Finance Division, Revenue Division and Economic Affairs Division; and (ii) Ministry of Interior, comprising the Interior Division. The Cabinet Division shall take further action immediately to implement the prime minister’s orders. The Ministry of Planning, Development and Reforms has yet not been handed over to any minister. Prime Minister Khaqan wants to retain the Planning Commission with him to ensure timely completion of the CPEC projects. A source told Pakistan Today that Principal Secretary to prime minister Fawwad Hassan Fawwad was behind the move and he was maneuvering the situation in his favour. “Since it has already been decided that Fawwad would be removed as the principal secretary, the powerful bureaucrat wants to get hold of all CPEC projects by becoming the deputy chairman of the Planning, Development and Reforms Commission,” it said. We have to suffer a little more. Nawaz and coterie plan to do whatever damage they could to the economy and the country. He and his Modal Town killer are asking for it.